It's been years since you geared up for your toddler - now you want to help your kids gear up for theirs - and outfit your home for your grandbaby. The reviewers at Z Recommends fill you in on what's new, what's hot and what's the best buy. Keep those toys out of your way between visits. The proliferation of toys is a challenge in any home, but having a few for visiting toddlers makes sense for most grandparents. To keep a small supply out of sight between visits but accessible when the kids are visiting, try a small piece of dual-purpose cube storage furniture like KidCraft's bright but simple wooden Storage Bench; cubby drawers allow kids to find toys more easily than single-compartment toy boxes, reducing major messes. For temporary storage, a lightweight, canvas Collapsible Toy Box from Kangaroom can be folded flat and tucked in a closet when not in use. And for furry-friend overload at their home or yours, try the innovative Boon Animal Bag, a fuzzy, oversized bean bag with zippered portholes for stashing and retrieving stuffed animals that doubles as toddler seating. Show the parents you're hip to cool kids' music. Although virtually every aspect of children's entertainment has changed technologically in the past two to three decades, nothing has changed as much as music for kids. Maturing members of Gen Y, now moms and dads themselves, have injected a new indie-rock infused spontaneity into kids’ music, and your kids – your grandbaby's parents - can now get down with the same sounds that they're playing their babies. Here's your opportunity to show them you still have your finger on the pulse - gifts of great kids' music now could pay you back in cool points for years to come. To dip a toe in, try a band like The Terrible Twos or The Hipwaders, who craft complex and moving pop-rock that would feel at home on any college radio station. Songwriters like Morgan Taylor and Monty Harper craft literate, articulate tunes for children that won't bore adults to tears. This vibrant new music subculture is changing by the day; check out kids' music review blogs like Zooglobble, weekly web radio shows like Spare the Rock, Spoil the Child. Help your grandbaby reach for the counter-top. If your grandbaby likes to help you in the kitchen or you want to encourage food-prep participation, the right stool is a must. We've found two natural wood models with high sides that keep children safe while they work at the counter-top. The Learning Tower by Little Partners is a great option. Its great safety features can put adult minds at ease while a large platform even allows more than one child to move freely - and it has adjustable height settings. Grandparents looking for the same features with a smaller footprint might enjoy Guidecraft's tall-sided Kitchen Helper, a similar device that folds up to store flat. Outfit your home with a space-saving potty. Successful potty training demands encouragement and access in all environments where a toddler spends time, but potty seats can be bulky and space -consuming. The cool looking, low-profile BabyBjorn Potty is the perfect bathroom accessory for visiting grandbabies. The seat is easy to clean and cute as all get-out. Time to get the kid a camera. 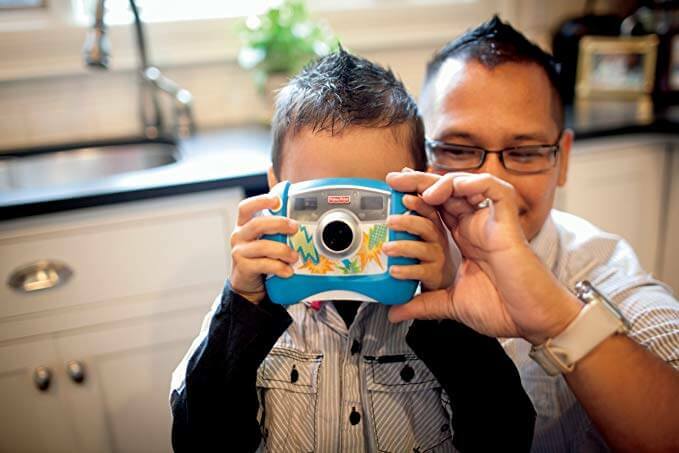 Welcome to the future: Believe it or not, Fisher-Price has made the concept of two-year-old photographers a reality with its Kid-Tough Digital Camera, a landmark piece of technology and design that has since been imitated but never outdone since its introduction in 2006. Housed in a durable, rubberized shell that brilliantly protects all fragile components while creating easily- gripped handles for eager little hands, the camera features a small, low-resolution LCD screen and simplified controls. (If you care, it has an interpolated resolution of 1.6 megapixels). If you're thinking ahead to your grandbaby's two-year birthday, this is the perfect gift. Just think of all those pictures the kid will be able to upload to your family album! The Kid-Tough dramatically outperformed upstart competitor camera Kidizoom in digital print quality tests by Z Recommends, and parents and grandparents who don't expect state-of-the-art imaging but demand durability and ease-of-use will be happy with this unusual toy; although the company recommends it for ages 3 and up, we think it is perfect for kids as young as two and up until about age five, at which point they'll be ready for either a higher-resolution, less-"tough" camera or, given the pace at which adult digital camera technology advances, an obsolete castoff that was this year's state-of-the-art. Toss the high chair - Baby's ready for a Kaboost. At age two, your grandbaby is ready to transition from high chair to booster - and that's an opportunity for you to get rid of a bulky piece of furniture and replace it with something more convenient. The innovative Kaboost chair booster is a clever new device for households with children or grandchildren who can sit at the table without a "seatbelt." Unlike seats you strap to a chair, the Kaboost lifts everyday chairs from the floor by extending the legs; its smart design maximizes stability and allows it to fit virtually any chair. Children get a kick out of sitting in a "big chair" instead of a booster seat, and the Kaboost collapses for easy carrying with an integrated handle, convenient for restaurants and the homes of friends or relatives.